The island nation of Sri Lanka is steadily moving on the tracks towards transforming the Mice potential of the hospitality sector. While tourism continues to grow in Sri Lanka, a uniquely charming destination with a wealth of natural and cultural attractions, a varied landscape, temperate climate and genuine, warm hospitality, there are some clear winning factors to build on its Mice potential. Easy accessibility for example, with direct international flights from Europe, the Middle East and Asia and easy e-visa application for most nationalities, Sri Lanka is also a value-for-money destination. Anantara is among the first brands to promote Mice tourism in the emerald island. Situated on the southwest coast of the island, Anantara Kalutara is only a 90-minute drive from Bandaranaike International Airport and downtown Colombo. The architecturally stunning resort offers a naturally exclusive setting, with the sacred Kalu River on one side and the Indian Ocean on the other. 141 guest rooms, suites and pool villas dot the manicured grounds. Resort facilities include the Anantara Spa, which offers an inspirational setting to pursue physical, emotional and mental wellbeing, an on-site water sports centre and a selection of dining options from East and West. 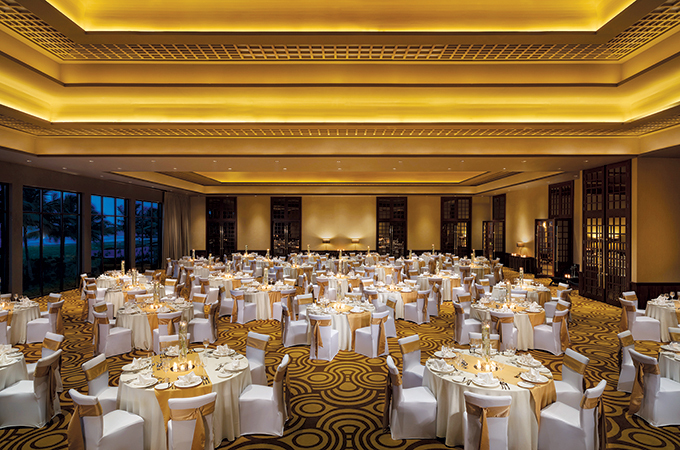 Anantara Kalutara has just unveiled its new purpose-built meeting complex. Comprising the 630 sq m two-storey ballroom, three meeting rooms and expansive indoor and outdoor pre-function areas, the new facility boasts panoramic views of the Indian Ocean and river. Floor-to-ceiling windows maximise natural light and give way to stunning sunset views. With the option of hosting large groups, the facility features a ballroom that can accommodate 400 guests for a reception, or 350 for banquets and meetings in classroom or theatre style. Designed for maximum flexibility, the pillar-free Ballroom can be divided into two equal sized soundproof spaces, both equipped with state-of-the-art mood lighting and audio-visual systems. Anantara’s dedicated meeting and events team plans personalised event experiences, from VIP welcome gifts, themed décor and entertainment, to innovative catering options. Delegates can celebrate corporate milestones with a sunset cruise on the Kalu River or enjoy teambuilding activities including water sports on-site. Corporate employees can be rewarded with once-in-a-lifetime experiences such as a wildlife safari or whale watching trip and a range of inspirational and authentic explorations can be offered to the island’s natural and cultural attractions, all within an easy drive from the resort. The colonial era can be relived with a visit to the Unesco World Heritage Site of Galle’s Portuguese and Dutch fort, offering a charming enclave of boutiques, museums, modern bistros and bars. For a country famous for its tea, the nearby 200-acre Handunugoda Tea Estate offers a pleasurable low-country tea experience and serves as a working private tea museum.